I must begin with a confession. While Dottore Gianni the experienced traveler was writing the last sentences of the last post he was also missing his train to Durham! I’d convinced myself that it left at 10 am (which IS the time my train leaves for London on Monday), but at about 8:58 when I checked my ticket I saw that my train left at… 8:58! After a bit of pounding my head against the wall I told myself that, no matter what, I really should get to Durham. I rushed to the rail station and obtained a ticket in minutes, for a train that left in minutes, at 9:33. 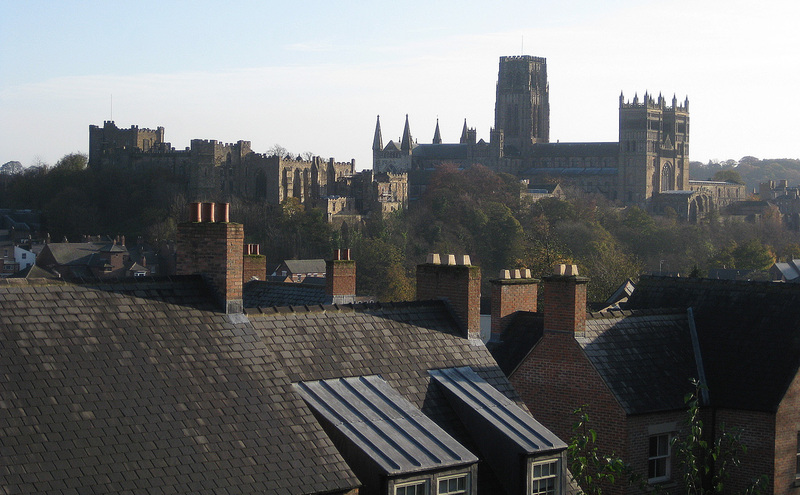 Granted I lost the great deal that I’d got with my senior rail card fare, but because of the senior rail card I paid only 14 pounds for the ticket (would have been 21 pounds if I paid as an adult) – so I lost some money, but it was certainly worth the extra expense, as Durham proved quite a delight! 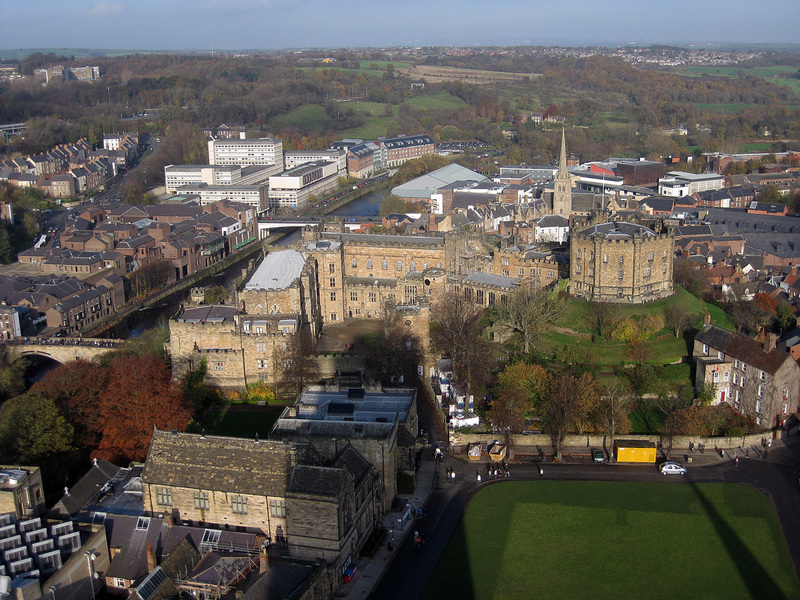 Durham is about 45 minutes north of York by train, on the way there is a shift in geography. The Durham Rail Station sits on an elevated piece of land that looks down over the city, and across to Durham Castle and the great Durham Cathedral. The path from the station to the city is very well marked, and meanders down several sets of steps, that I realized I’d have to climb again when I was set to leave. There were also buses, sorry – coaches, but having finally got to Durham I was ready for an adventure, and a good walk. As one descends into the city he, (I, Dottore Gianni in this case), becomes quickly and clearly aware that he will have to walk up again to the cathedral and castle. 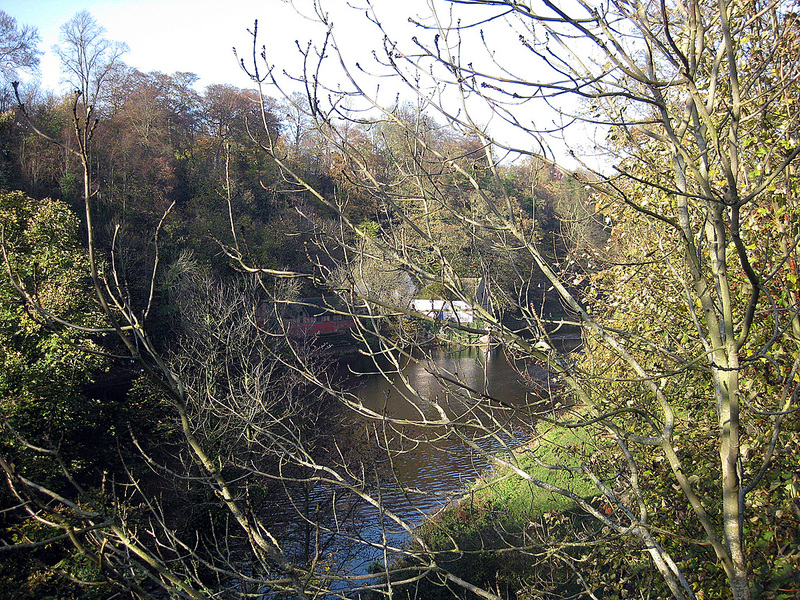 But that walk is made very pleasant by the bridge spanning the River Wear high above it and the old town area through which the route lies. 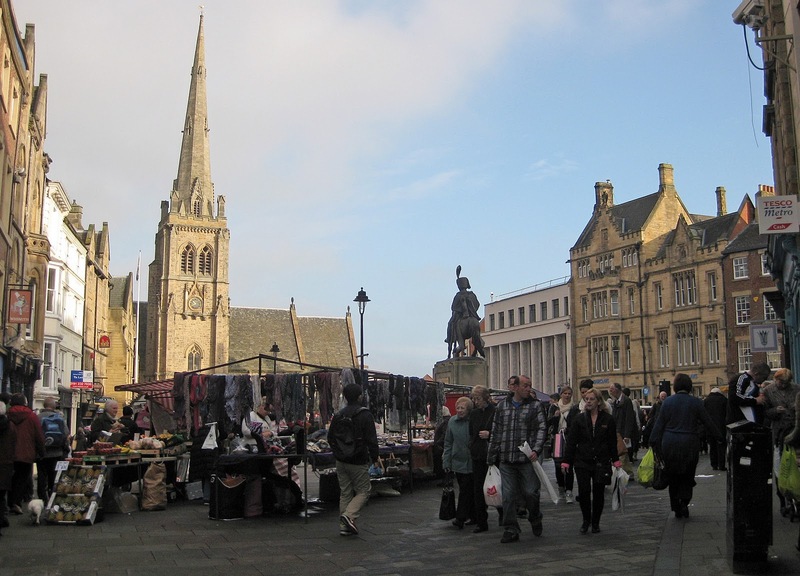 This route is of course filled with shops, many of the same chains that one sees in most English urban areas, along with other local shops and many cafes and restaurants and pubs as well as the chains like Pizza Express, Café Rouge, etc. I approached the central square, called Market Square, from below it. Upon entering found myself thinking I might be in a Tuscan hill town in Italia (Dottore Gianni’s spiritual home) rather than in a British city centre. It’s a square of some size, with an equestrian statue in the middle and a sort of slant to the roadway that reminded me a tad of Arezzo, one of my favorite cities in Tuscany. I almost expected to look to my left upon entering and find the colonnade built in Arezzo by Vasari. 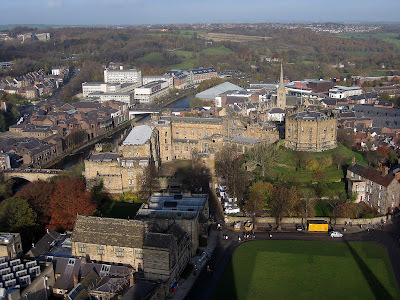 But of course Durham is not an Italian Renaissance town and I shook off the theory that I’d closed my eyes and suddenly landed elsewhere in Europe. "The sculptor of Londonderry was Signor Raphael Monte did not, as is aften thought commit suicide owing to the discovery of a flaw in his creation by a blind beggar man. Legend has it that Monti boasted that no one could find a flaw with his statue until one day a blind man pointed out that the horse had no tongue by feeling inside its mouth The legend -- is a legend." Does anyone else find that tale a tad amusing? In any case, true to the name of the square, a farm market, along with stalls of odds and ends surrounds the statue, and I strolled through it quickly to have a look. There is a very large indoor market as well, which I just peeped into, but I was not there to shop (though I could not resist stopping into my favorite chain clothing store, Edinburgh Woollen Mills (it’s wool and it’s cheap), which was having a sale and yes from which I bought two items – AFTER my pilgrimage to Durham Cathedral. Just above Market Square one can choose to walk downward again to another and I assumed more modern part of town or up. So upward I strode, for of course that way lay the cathedral. The road was arranged on a sort of curve so that the climb was not as difficult as I’d first imagined. And there, after a walk along very narrow walkways and cobbled lanes, the cathedral stood, or rather towered. The castle next to it is of some size, but seems dwarfed by the solid mass of this great Norman (elsewhere in Europe it would be called Romanesque) structure. It overwhelmed me from a distance when I got a quick glimpse of it on my first rail journey to Edinburgh back in the fall of 1999, it had continued to overwhelm from the rail station and all the way through Durham as I walked towards it, and once I was on ground level to that on which it was built the cathedral did not disappoint. 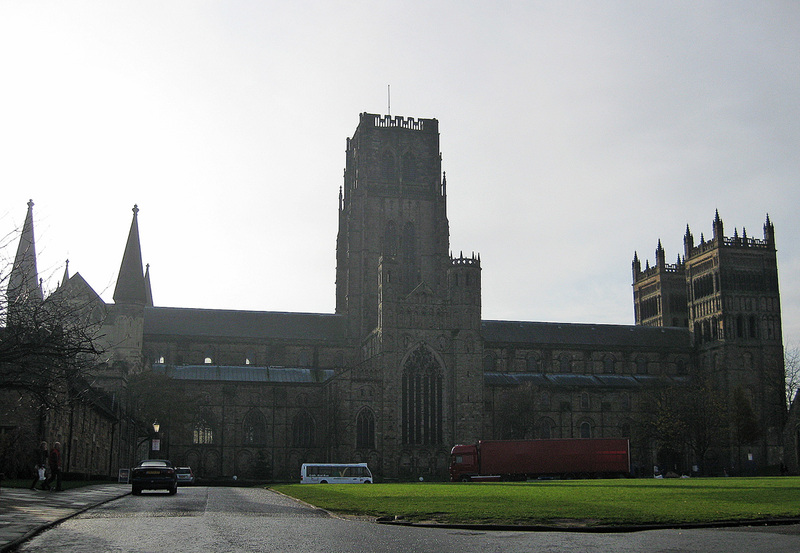 I’m not good with measurements, and I’d have been helped by accurate models placed side by side of the many cathedrals I’ve seen on my travels through Europe, but Durham Cathedral, founded in 1093, is without question a colossus. 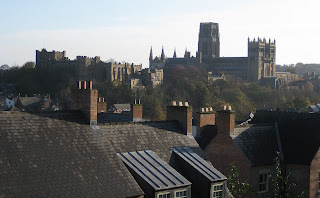 Part of its powerful effect on me comes from my having seen more European cathedrals built a bit later, during the Gothic phase of construction, which, through flying buttresses created a sense of airiness and height (as if reaching towards heaven) that solid Norman/Romanesqe cathedrals like Durham lacked. But what Norman cathedrals lack in lightness they more than make up for in sturdy mass, creating to my mind the effect of the powerful force of the Church on earth more than an airy aspiration towards God above. And this is the largest Norman cathedral (i.e. in the U.K.) of them all, and one of the most massive that can be found anywhere in Europe. 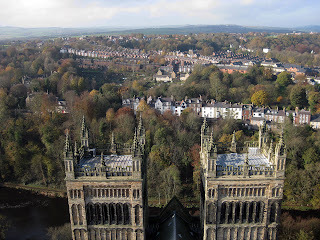 One would generally enter a cathedral from the west, where the two matching smaller towers of the church are situated, but they look out over the chasm through which the River Wear runs below. 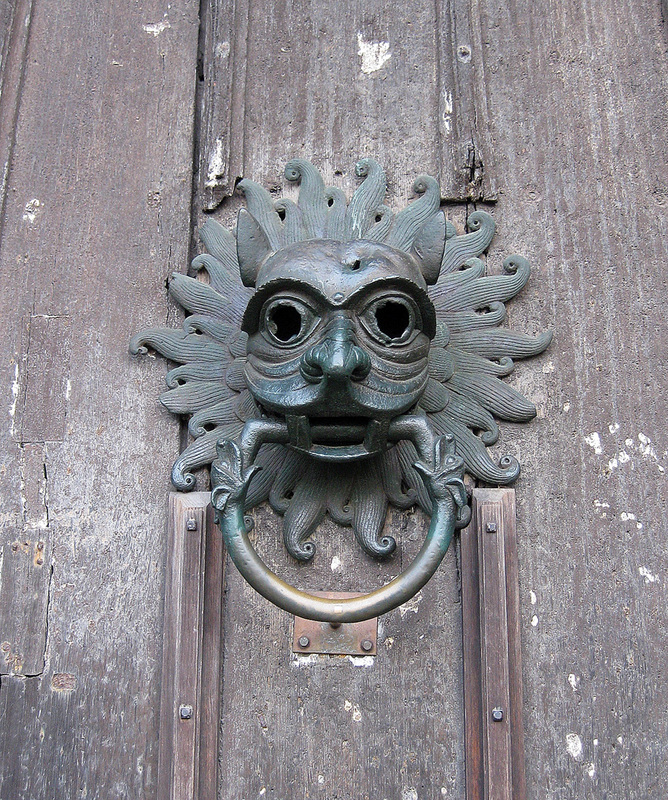 Instead one enters through the North Door smaller than one might expect, but here the interesting history of Durham Cathedral begins. 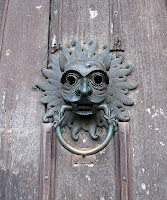 My attention was drawn to a monumental knocker, in the shape of a rather frightening face, called the Sanctuary Knocker. In the medieval era anyone who had committed some serious offence or other could knock and be admitted and protected from outside authorities for up to 37 days, at which time they had to stand trial or leave the country by the nearest port. I immediately envisioned Quasimodo, crying “Sanctuary!” in The Hunchback of Notre Dame. On that dramatic note (or scream) one enters a building as startling in its interior as in its outside. Friendly greeters chatted with me, explaining the places to see, also reminding visitors that this is one of the few cathedrals that remains free to visit, all the while encouraging, and rightly so, a donation. 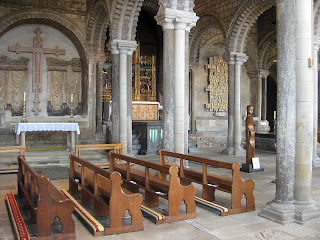 I chose to head first into the Galilee or Lady Chapel, near the entrance, at the western edge of the cathedral. I’d seen Lady Chapels before, but not usually in this location. 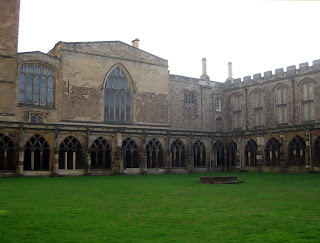 I’d always thought they were chapels devoted to the Virgin Mary, and perhaps they are, but the cathedral brochure explained that for many years this was a Benedictine monastery as well, until 1539, and during those years the Lady Chapel was the only area in which women could worship. So! “There’s a double meaning in that…” The chapel was added in 1189. It’s a lovely little place, and was the first indication on my visit of the excellent modern art which stands side by side with the early work. An lovely abstract statue of the Annunciation by Josef Pyrz, a Polish sculptor working in Paris, stands in the middle of the chapel. It was here that I was politely but sternly reminded that I was not allowed to take photos in the cathedral. I’d not seen a sign to this effect or I’d not have tried, but obeyed from that moment on. Otherwise I might have been struck by lightning, God’s fire! It was too bad about the no photo policy, for I don’t have words fine enough to describe the interior. A great nave, with a much higher and more elegant ceiling than I’d have imagined, looked towards the quire (Choir), where a chorus was rehearsing for what seemed to be quite a concert for which technical elements were being set up. So I was able to hear the organ and a wonderful group of voices that made the visit even more impressive than if it had been a silent one. While the stained glass windows along the nave were destroyed during the Protestant Reformation in the early sixteenth century, many were replaced with new stained glass in the Victorian era and others were replaced in the 1950s, one of them as a memorial to the Royal Air Force. Behind the quire was as usual the great altar, and just behind that the tomb of and memorial to St Cuthbert, the greatest saint of the north, bishop of Lindisfarne (holy island). 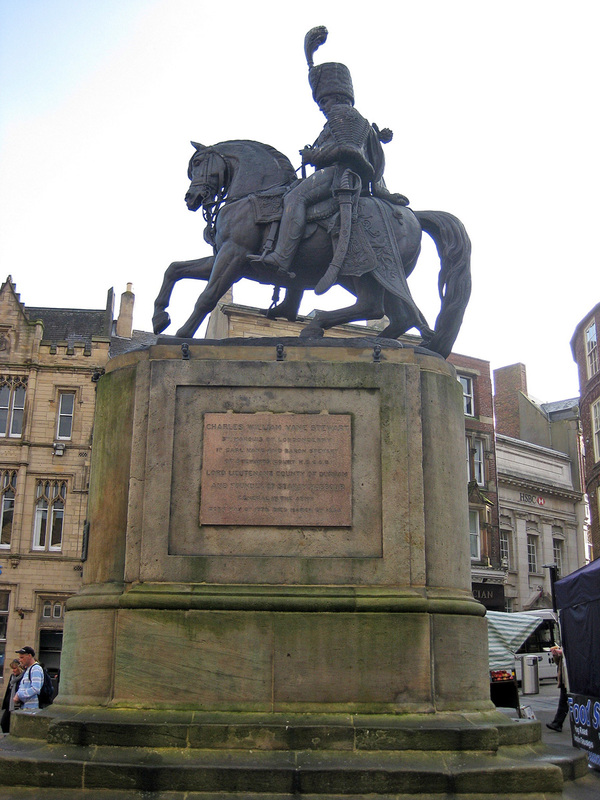 He died in 687 and an Anglo-Saxon shrine was built to house his body. The shrine became a place of pilgrimage in the middle ages, and to an extent remains one now. I visited the cloisters next, an area from which I could snap a few photos, also an area that houses the restaurant that was once the wine cellar of the monks. I looked at the menu, but then decided that I could make the climb to the tower – 325 steps up, and as one of the docents reminded me, just as many down. They had a set of beads and when anyone went up to the tower they moved a bead over. He explained that once an elderly couple had climbed to the top and sat down to look at the views. They fell asleep and very fortunately for them awakened during Evensong. Had they not they would have spent the night aloft, with no one in the cathedral realizing it. Thus the beads! I have said this before, will probably say it again: I can walk forever on a flat but make me climb and I huff and I puff and I sweat and I sweat! I did so on this occasion but made it to the top and was rewarded with terrific views, which my point and shoot camera style will not adequately capture. 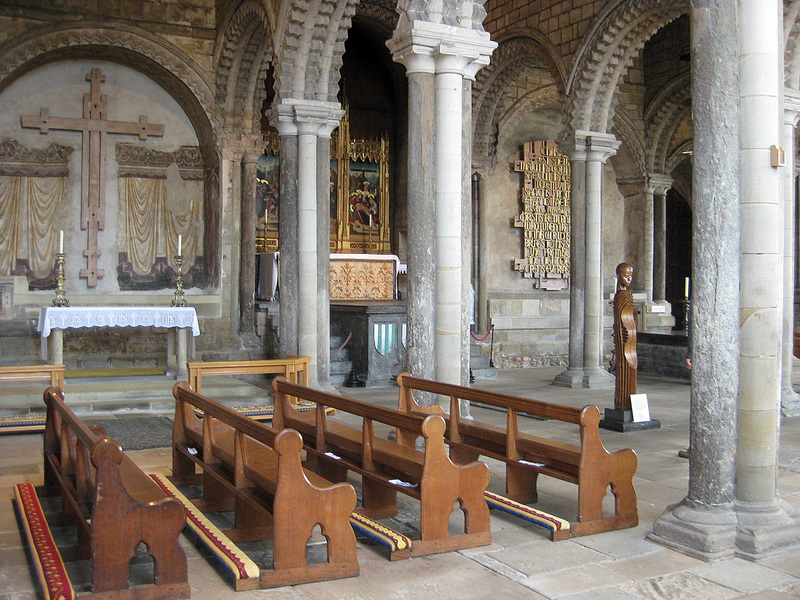 But I loved it, had my aerobic workout for the day, and when I returned to the nave they pushed my bead back into the correct column. For my reward I treated myself to lunch at the restaurant. I find myself still wishing I’d gone for the beef stew, which looked absolutely delicious, but I settled for a wonderful lentil vegetable soup and a sandwich (£3.50 for the lot!). The pint of Durham Ale brewed specially for the cathedral: St Cuthbert Special Pale Ale 6.5% alcohol. This is a religion I could believe in! In fact the alcohol content is just a tad higher than the pint I had an hour ago at my favorite pub in York, and maybe in the world, The Three-Legged Mare. I usually go for the 4.2% Yorkshire Terrier, but this afternoon I had need of the Micklegate which weighs in at 6.1% -- that and a pack of crisps (potato chips) with sea salt and I was…well, ready for whatever the rest of the day might bring upon me, which fortunately is not much! I’m now sobering up with tea and an afternoon cake that seems laced with whiskey, after which I will stumble back down the stairs to the restaurant to have the Sunday roast – will I choose lamb, roast beef, pork or gammon (what the hell is gammon, anyway?)? But more of that after I’ve et it! 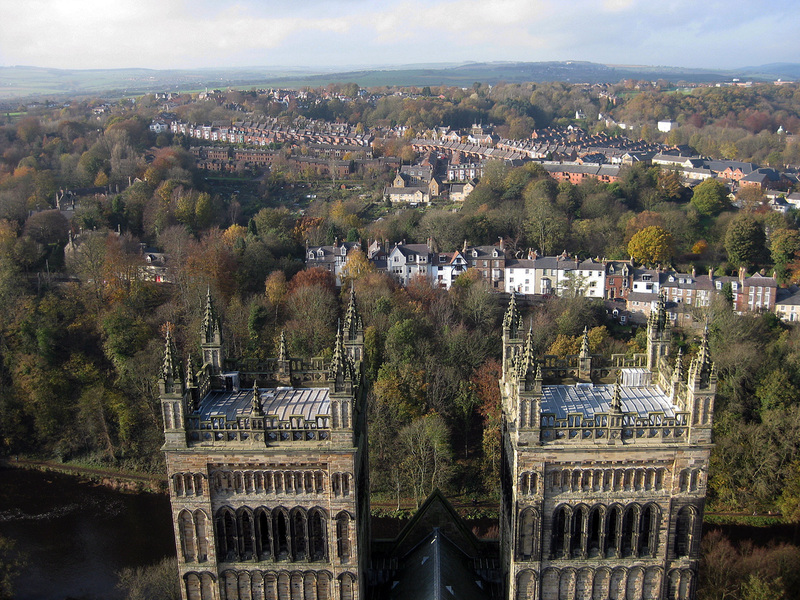 But back, distractedly, to Durham. After lunch I had had my fill of food, and of the cathedral, though I probably could have whiled away more time at one of the most interesting of the many cathedrals I have spent time in. So I strolled down to the banks of the river, looked in at the college housed in cathedral grounds, then made my way back to the old town to make a purchase or two (it ended up being both) at The Edinburgh Woollen Mills – a flannel shirt and a sweater, both on very good sales, both needed to fill out my sparse winter wardrobe. I strolled around a tad longer, wishing for a moment that I’d chosen to spend a night or two there -- what a great day trip! 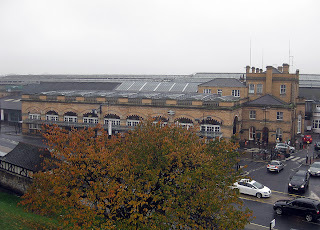 But knew I had chosen well in York, if not wisely in my hotel, and climbing back to the train station – after the 325 steps to the top of the cathedral tower it was simple – caught my train back to York, listening to Haydn on the way.